Sealcoating provides 3 major benefits – surface protection, aesthetic appeal and saving money. Sealcoating can be spray applied using a wand or spray bar or hand applied using brushes. ALL OUT uses the finest, highest quality products on the market, all of which are approved by the Federal Aviation Administration for use on airport runways. 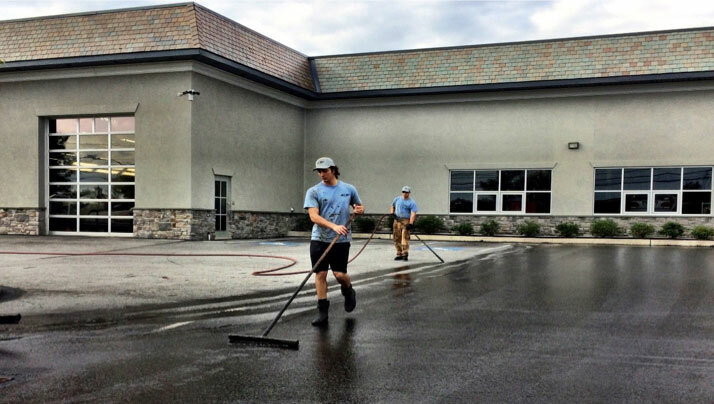 Beautify your property with a nice clean dark black parking lot. Protect your asphalt with a layer of sealer which will take the beating from the weather and traffic loads rather than the bare asphalt alone. Save Money as sealcoating will greatly extend the life of your pavement and you will not have to Repave.